In my last post, I extolled the virtues of technology (specifically the Internet) with respect to the role it has played in languages education. In this post I will take a different approach, and explore the value of low-tech in a high-tech world. Sometimes a lo-tech approach is more practical. Using technology can sometimes require additional equipment that costs too much money, take too much additional time, or require additional resources or permissions that are difficult to obtain. After weighing the costs and the benefits, sometimes the lo-tech approach may just be the more practical option. 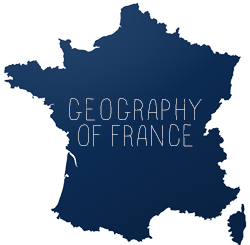 I once did a project where students made a short dialog and narrated it in French using PowerPoint, but it took so much class time for students to get the formatting right that it wasn't worth repeating. That said, I'm still looking for other hi-tech options that are more efficient yet still equally cost-efficient and safe (don't require sign-up, etc.) and plan to revisit the idea in the future. Sometimes a lo-tech approach is more tangible. While technology allows students access to an infinite number of tools and authentic resources, sometimes a photo or a video of something or someone just doesn't have the same impact as seeing it in person. Why Skype with a guest speaker if he or she is able to come into your classroom? 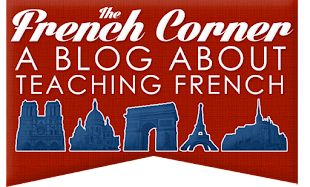 Why have digital pen pals if you want your students to hold an authentic hand-written letter from France? (Read about my pen pal project). Additionally, having students create lo-tech work allows you to display it in your classroom. I love displaying work all around the classroom, so I can't imagine how bare my walls would look if I didn't have students create anything tangible! Sometimes a lo-tech approach is safer. Certainly allowing students to use the internet comes with certain inherent risks, even with careful planning and monitoring. In some cases, however, the risks are greater than others. If you work with students under the age of 13 (as I do), keep in mind that they will not in many cases be able to sign up for certain services online. Additionally, sometimes the project you want to do requires an extensive amount teacher moderation in order to be safe. Sometimes a lo-tech alternative is the best alternative in situations like this. A lo-tech approach is a good back-up. It's not a bad idea to have a lo-tech back up to your hi-tech project. We all know technology tends to fail us at the most inconvenient times. As teachers, we need to be prepared for the unexpected. Hybrid projects allow you to combine the benefits of high-tech and lo-tech. Although I can't claim I've done any myself yet, I've enjoyed learning about these new hybrid projects that combine the traditional with the digital, usually using QR codes. Colleen Lee-Hayes and Nicole Naditz are just two language teachers who have used QR codes to add a technological component to a lo-tech project. The graphic above by Bill Ferriter (click it to visit his Flickr page) has made its way around the Twitterverse and blogosphere, and with good reason. 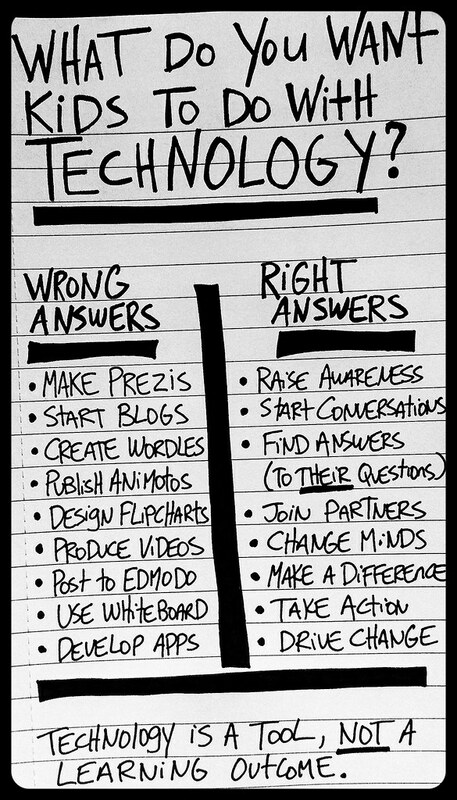 I think it really sums up how teachers should approach technology - as just one tool to accomplish a task tied to your objectives. It can be tempting to want to try out every new program and app, but before doing that, it's a good idea to consider where the technology as it's used in your task falls on the SAMR model. 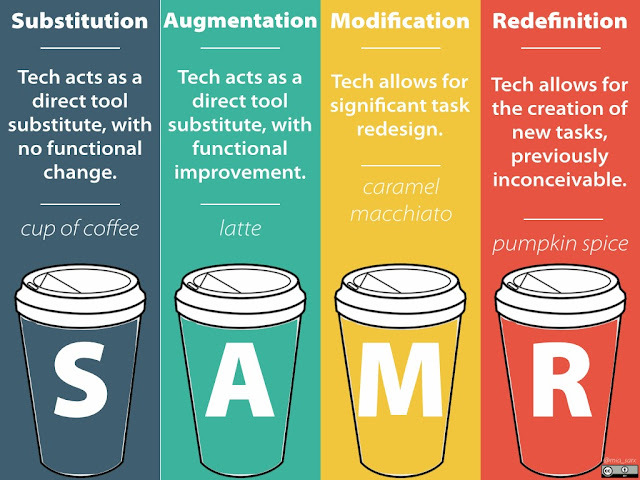 The SAMR model, explained below by Jonathan Brubaker, complete with a coffee analogy, helps teachers determine how useful a certain technology is in conjunction with a certain task. Just because your technology falls in the "substitution" category, though, doesn't mean it's not worth using. When large funds, extra class time, extensive parent permissions, and other concerns are at stake, though, you might find the lo-tech approach to be a better alternative at the substitution and augmentation stages. Click on the above graphic to visit Jonathan's blog and read his thoughts on the SAMR model. As teachers, we must think critically about how we are using technology in the classroom. Our objectives for students are always the end goal and the starting point for planning an activity. Once we determine those and consider the SAMR model, we are better equipped to harness technology in order to use it to its fullest potential and use it wisely.